Well, not exactly. 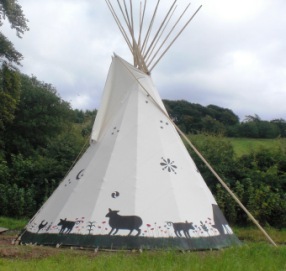 Dances with pigs, possibly, as this tipi (teepee, if you are a cowboy or from Hollywood) has been erected not far from us at Whitmuir Organics at Lamancha. Nearby, on the other side of the hedge, are families of a dozen or so piglets and a couple of sows so big that you really would not want to get into an argument with them. The Whitmuir Organics sheepdog (Millie, so not exactly a dog) decided to round up all the piglets but was spotted by one of the mothers. Have you ever seen a pig chasing a dog? It’s a sight to behold, especially when the pig is faster… hard to believe, but true. The dog jumped the gate. The pig didn’t.